and other areas including SW Asia, North Africa, and the "Middle East." "War of Lies: Why Are US Troops Still in Iraq?" "Close Guantanamo: Still America's Shame"
Dr. Farris, an orthopedic surgeon from West Linn, recently returned from a trip to Gaza, and will describe the type of injuries he saw in "the largest open-air prison on Earth." 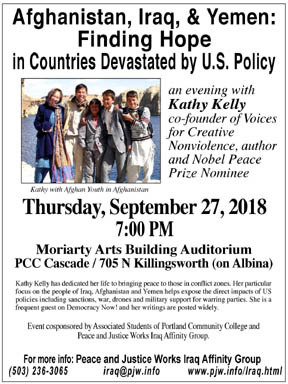 Sponsored by the Portland Chapter of Jewish Voice for Peace, cosponsored by the PJW Iraq Affinity Group and others. in Countries Devastated by U.S. Policy"
On April 14, a giant Amphibioius Landing Dock will be docked at Portland's Terminal 2, with public tours being given on the 16th, 17th, 18th and 20th at 2 PM. 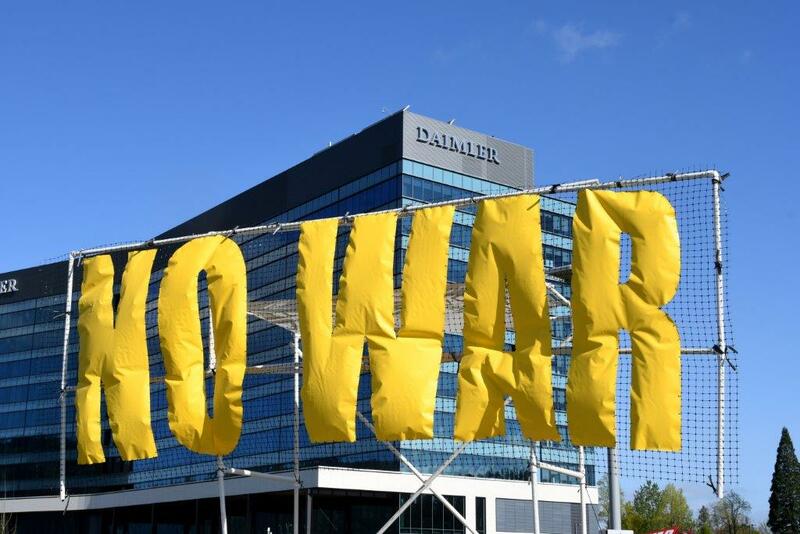 The ship is being officially commissioned with a ceremony at 9 AM on the 21st and we want to send a message: No Warships in Portland! Read about our October 2017 efforts to Keep the National Guard from deployment to Afghanistan, Iraq and elsewhere. (letter signed by 18 organizations and a military family to Governor Kate Brown). 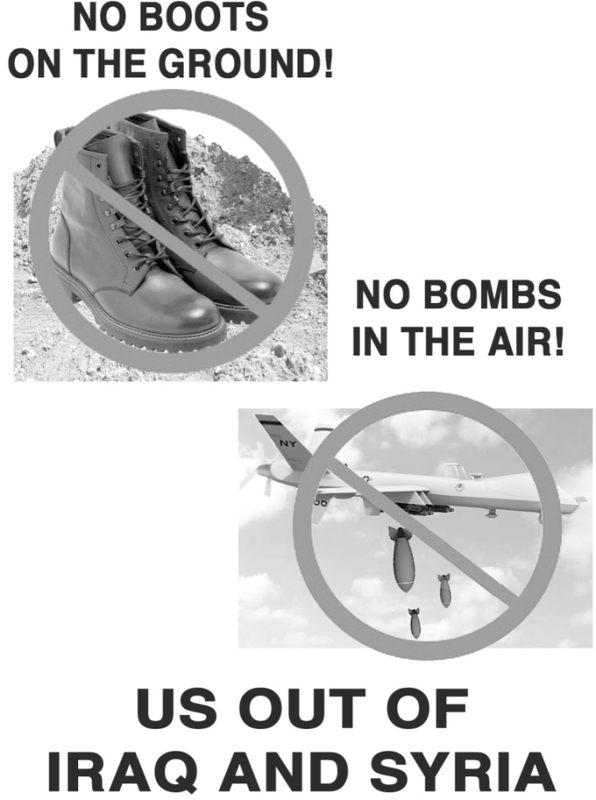 This poster was created by the PJW Iraq Affinity Group to refute the calls for "boots on the ground" in Iraq and Syria, and to be clear that saying we don't want troops engaging in combat also means no drones or aircraft dropping bombs. Download it, print it, and post it! End Authorizations for Use of Military Force! "Iraq for Iraqis Now! 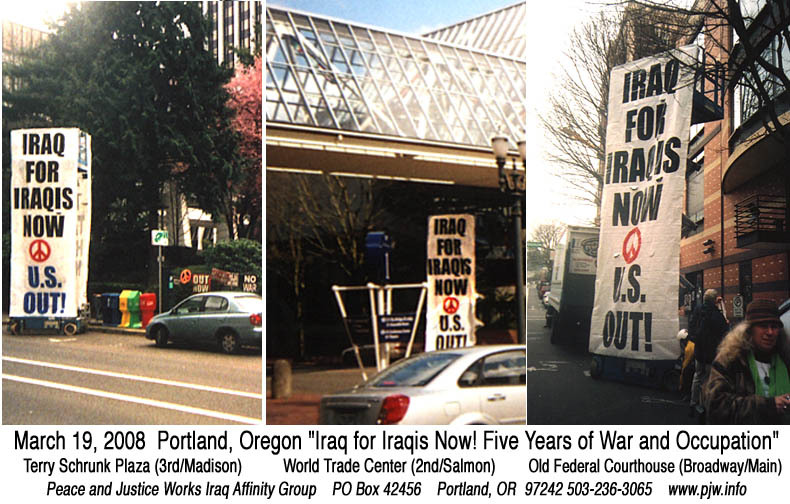 U.S. Out / Five Years of War and Occupation"
January-May, 2007: The Oregon House and Senate each passed resolutions regarding Iraq. calling for the troops to come home and to fund human needs. adoped unanimously on November 30, 2006.
now is the time for Oregon to take a stand as a whole! but UN gives control of Iraq to U.S.
and give full authority in Iraq to the U.S and U.K. Comments from Institute for Public Accuracy on the lifting of sanctions. Please note below the revised information about our group, which has reassessed its mission in the aftermath of the war on Iraq and the lifting of sanctions. We have also added a contacts and references page for quick resource info. Iraq 15 Years Later: Forever War? 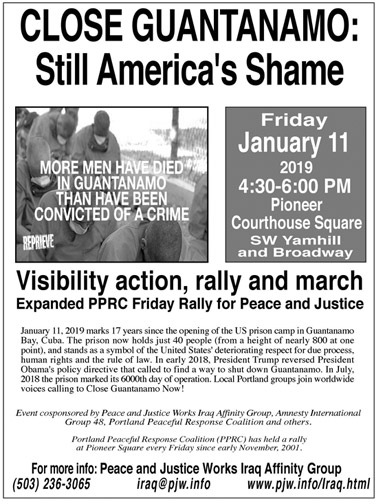 We are a secular grassroots group connected to the local peace and justice organization Peace and Justice Works. We are men and women, young and old, of various ethnic heritages and religious and spiritual beliefs. We organize to improve the lives of the Iraqi people and ensure that Iraq's sovereignty is regained and respected. We will continue to oppose the expansion of the "War on Terrorism," especially as the U.S. threatens Iraq's neighbors with military action. We believe the United States' pre-emptive war on Iraq and subsequent occupation are illegal and immoral. Following over twelve years of the most stringent economic embargo in world history which killed hundreds of thousands of Iraqis, we find the image of Americans as "liberators" a shocking rewrite of history. The regime of Saddam Hussein was a brutal dictatorship, which caused fear and repression in Iraq. However, U.S. policy--both in installing and supporting Hussein and in deliberately preventing the rebuilding of the country's infrastructure for 12 years--is just as much responsible for the suffering there. 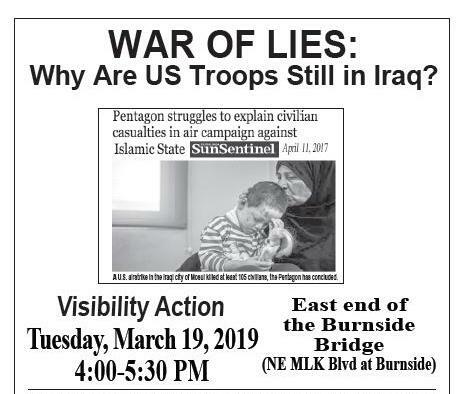 The Iraq Affinity Group organizes public visibility actions, teach-ins, forums, letter-writing and phoning efforts to raise awareness of the situation in Iraq. We encourage people to share information with their friends, families, neighbors and co-workers. Reliable information about the U.S.' role in Iraq is difficult to find in the mainstream media. As such, the American public must get its information from elsewhere about Iraqi military and civilian casualties, the hundreds of thousands of Iraqis who died due to U.S./U.N. sanctions (1990-2003), and the probable ramifications of the U.S., U.K, World Bank and International Monetary Fund having complete control of Iraq's oil wealth. The terms of UN Security Council resolution 1483 clearly identify the U.S. as an occupying power, yet call for an end to the occupation only once "an internationally recognised, representative government is established by the People of Iraq" By this Resolution, the U.N. retroactively approved of a war that it had opposed, and has given the U.S. an open-ended invitation to rule Iraq as a military satellite state. 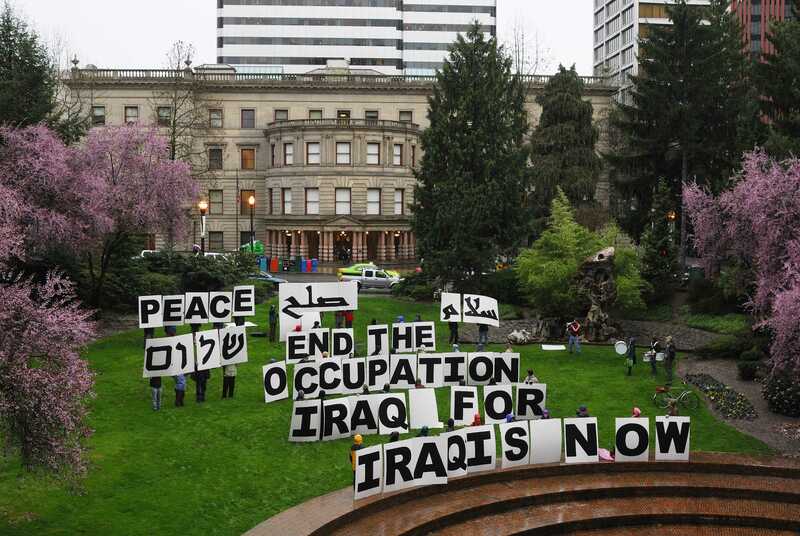 Many other groups in Portland and around the country are opposed to U.S. policy in Iraq. We keep in touch with them, sharing information and creating a local and national response and activity network. See our contacts and references page for more information. We get our information from various sources including U.N. documents, small articles in the Oregonian, the internet, eyewitness reports, and various journals in the library. There are numerous websites with great up-to-date information on the situation in Iraq. We publish fact sheets a few times each year. We have written or participated in the creation of several articles in the Oregon Peaceworker and the Portland Alliance. A major organizing effort of PJW since its inception in 1992, the Iraq Affinity Group's main focus has been to hold public activities regarding U.S. policy in Iraq. While our work was mostly ad hoc the first few years, the IAG has been meeting regularly since November, 1995, one or two times a month (please call for next meeting date!). 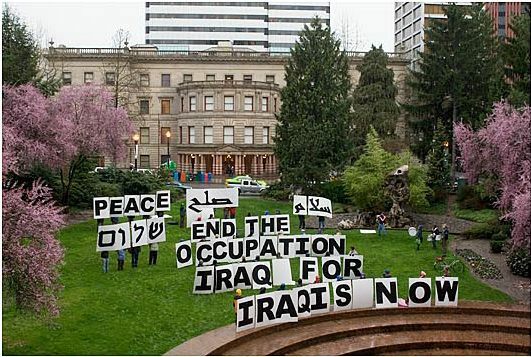 We were among the 150 plus groups who helped organize massive peace rallies against the bombing of Iraq in early 2003. From 1992 to the present, our Forums, rallies and demonstrations have brought the plight of the Iraqis to the attention of the public. From 1993 to 2003 on January 16th, we held a public event commemorating the beginning of the first "Gulf War," making connections to other U.S. policies and reminding the community that the war continued in the form of sanctions and no-fly zone bombings.